Rendering of Temple University's Student Health and Wellness Center planned at the intersection of 15th Street and Montgomery Avenue. 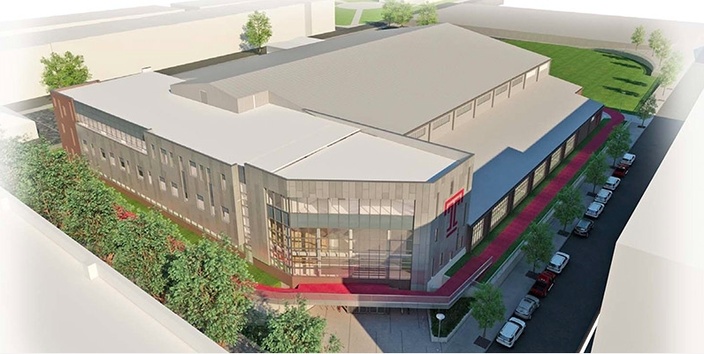 Temple University will break ground next month on a state-of-the-art Student Health and Wellness Center located just a half a block from the site of a proposed $126 million stadium that has drawn fierce resistance from members of the surrounding community. The university announced Thursday that the two-and-a-half story facility planned at the intersection of 15th Street and Montgomery Avenue will offer an enhanced clinical space for students enrolled in the College of Public Health, as well as space for recreation and weight training. The 95,000-square-foot project was designed by Moody Nolan, the same architecture firm hired by Temple to complete a feasibility study for the stadium proposal at a site bounded by Broad Street west to 16th Street and Norris Street south to Montgomery Avenue. 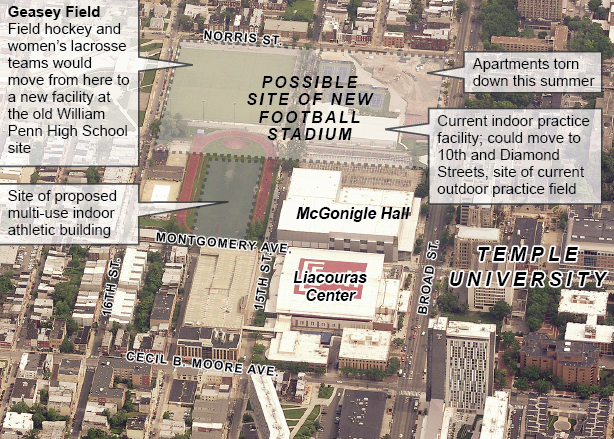 Map of possible site for proposed Temple stadium. When Temple initially announced funding for a stadium design plan in February, the Board of Trustees referenced a student recreation center and retail as part of the overall vision. 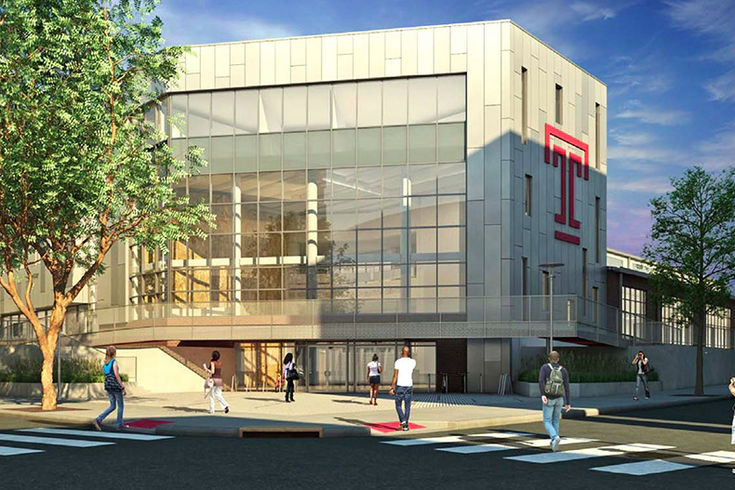 One month later, Temple's Board of Trustees approved a $28.5 million facility with space for indoor recreation, athletics and clinical programs through the College of Public Health. Temple spokesman Brandon Lausch confirmed to PhillyVoice that the new Center for Health and Wellness is the same recreation center first referenced by the Board of Trustees in its stadium resolution. "Although the two projects were designed by the same architect, they are relatively independent of one another," Lausch said. "Construction costs were approved separately." There could be opportunity for synergy between the two properties, however, in the event that the stadium plan moves forward, Lausch added. Temple University President Neil D. Theobald expressed enthusiasm about the Student Health and Wellness Center, referencing only the university's comprehensive campus plan for the years to come, with no mention of the stadium. The portion of the new building dedicated to the College of Public Health will primarily serve the occupational and physical therapy programs as they migrate from Temple's Health Sciences Center to Main Campus. An academic area, meanwhile, will include new applied labs, lecture halls, smart classrooms, and a demonstration/teaching apartment with accommodations for guests with disabilities. The recreation space will double the free-weight area currently available to students and will feature a 70-yard synthetic turf field for intercollegiate athletic competition. Temple's 36 club sports and 10 intramural sports will also have access to the field. In the main lobby, accentuated by a glass atrium, students will receive a new climbing wall, lounge area and juice bar. Aerial render of Student Health & Wellness Center. The Student Health and Wellness Center, targeted for completion in 2017, is one of multiple facilities planned at Temple's Main and satellite campuses in the coming years. Lausch said there were no immediate updates on the stadium. Moody Nolan's research and neighborhood tours will continue ahead of the next Board of Trustees meeting on July 12.